I’d been excited for the new Bad Suns album since it was announced. The rock band—consisting of Christo Bowman, Gavin Bennett, Miles Morris, and Ray Libby—has a staple “good times” vibe, but that doesn’t hinder them from trying unique song concepts. Their albums Language and Perspective (2014) and Disappear Here (2016) really struck a chord with me (pun intended). Language & Perspective features songs that exhibit a sort of lust for life. However, the album includes darker tracks about issues like anxiety as well. Disappear Here has a similar sound to their previous album, but with more developed rhythm and beats. Both albums are fast-paced with all the heavy drums, guitars, and vocals you could expect from a rock band. Bowman has a memorable voice that adds a lot to the emotions conveyed through all their music. 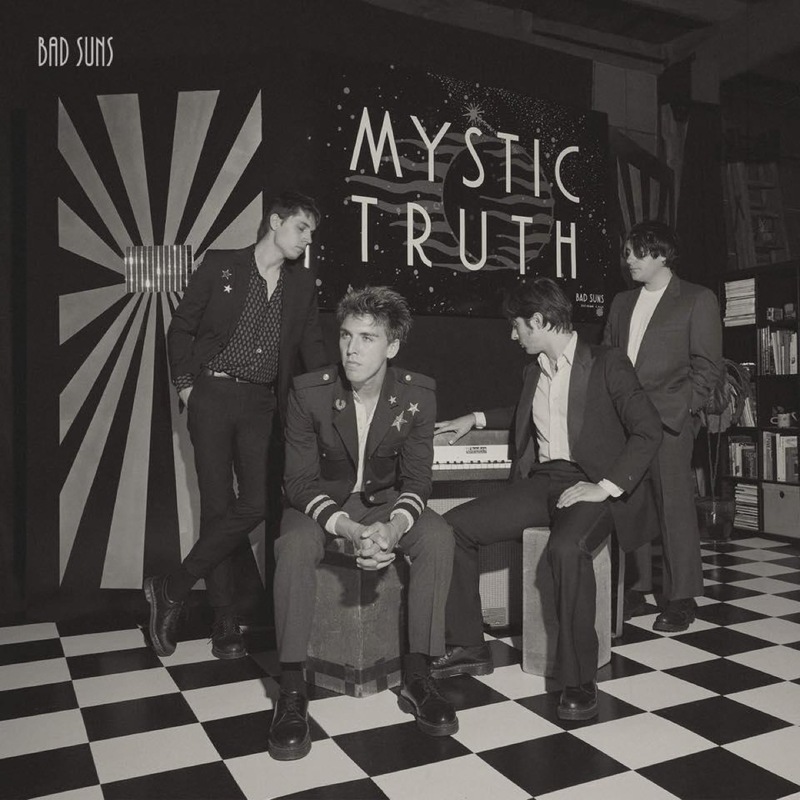 I was, as anyone would be, nervous about their new album, Mystic Truth—would it live up to the standards of the band I’ve grown to love? Their first single from the new album is “Away We Go,” a repetition-heavy song with a cute piano riff and slight distortion on the vocals. It could almost be mistaken for a pop sound had the drums not kept the rock vibe. “Hold Your Fire” was the next single released and, though apparent on all tracks, it has a lot of repetition as well. Repetition isn’t necessarily a poor decision, though, because as a single it has an obligation to be catchy and relatively easy to learn. The last single so far, “One Magic Moment,” follows the song form of first introducing a piano riff, then a vocal verse, then the combined effort of all instruments. “A Miracle, A Mile Away” has a significant play on prosody. The word “miracle” is sung softly and enchantingly, while “mile away” is held for much longer, giving the listener the auditory feeling for the meaning of the words. “The World and I” begins with hard left and right instrumental panning. Unlike most of the other songs, this one feels much fresher to listen to because the verses barely have any perfect rhymes. Percussion is the show-stopper on “Love by Mistake.” The track features soft guitar, wood blocks, shakers, and an instrument that sounds somewhat like a glockenspiel or xylophone. The lyrics “summer breeze, dancing trees by the lake” summarize the peaceful and whimsical atmosphere of this track. I think Bad Suns did change their sound and music technology towards a more concise approach this time around. I enjoyed their experimental and rough-at-the-edges sound from their previous albums, but watching a band grow into the sound they want to have leaves little room to be upset.